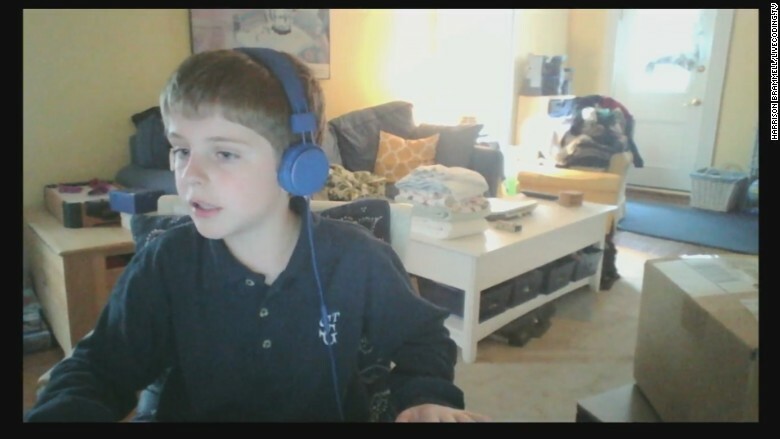 He codes, he live-streams, he's 11. Harrison Brammell live-streams from his living room while he codes his own video games. He likes fish sticks, and finishing his homework in the hallway between classes. He has more time for coding when he gets home that way. Harrison Brammell, a fifth grader from New Orleans, is just a tiny bit obsessed with learning to code. After he wakes up at 7-ish, he has a quick breakfast and hops on the computer before school. After last bell, and some soccer or bowling, he's back on, hammering away until bath and bedtime at 9, with a dinner break around 6. Harrison hogged the family computer so much his parents had to get him his own. A 4 GB RAM Toshiba (TOSBF) laptop now sits on a corner desk in the living room, hooked up to two monitors and a wireless keyboard. God forbid, if anyone touches "his hub" -- as his mother calls it -- watch out. Over the past few months, the little Louisiana resident has been teaching himself to code through YouTube videos and a book his dad bought for him from Barnes and Noble in January, Sams Teach Yourself Java. He's already taught himself to code a mini role-playing game from scratch. Harrison's passion was sparked when he started to play Minecraft, a video game where you create and destroy virtual worlds using blocks. Minecraft players can make modifications, or mods, to the game, which is how kids like Harrison start learning to code. "I like having control over my digital entertainment," he said. Harrison is currently working on developing a "Galatica-like" game. He also wants to start learning Objective-C, Swift (iOS), C, C++, C#, HTML and CSS. There are many programs out there which teach kids to code, both in and out of school. But Harrison is self-taught. He doesn't have a tutor. His parents work in non-tech fields. And his private school offers a basic keyboarding and computer awareness class -- but doesn't teach code. Harrison is also unique because he live-steams while he codes. "I want to be able to have a base of people who can help me find errors," he said. He wants to host a 24-hour live-streaming session so he can get as many people from all different time zones to tune in and serve as remote QA testers. "It's kind of amazing," said Bill Hilke, a game developer and live-streaming coder with thousands of followers. "I've never seen anybody else his age streaming." For Harrison, this is high praise. Hilke is the reason he live-streams. When Hilke started streaming on Livecoding.TV earlier this year, Harrison decide to follow suit. Harrison prefers the Livecoding.TV platform over YouTube because he doesn't have to edit his videos, which is boring and time consuming. It's also way smaller than YouTube or Amazon's Twitch livestream network, and he feels like he could get noticed. He's right: Recordings of his videos have been viewed over 1,500 times over the past few months, even if he only has a few dozen subscribers. It's hard for Harrison to build a fan base because he doesn't have a set streaming schedule. Most live-streamers do. But, with homework, after school sports, and a bedtime, he can't be consistent. During the week he's lucky if he streams twice, for half an hour or an hour. Most of the time he streams on weekends, when he can code and broadcast for longer stretches. As soon as the webcam is on, Harrison's charm lights up too. He greets viewers (sometimes in other languages), hums, wiggles his tongue, tells personal anecdotes. When he codes, he swivels in his chair -- a lot -- and lets his Cookie Monster mouse pointer do some of the entertaining too. "He's doing quite well for someone who's 11," Hilke said. Harrison's mother, Jennifer Brammell, believes coding will be important for his future job prospects (he wants to own software development business). Live-streaming, too, is beneficial. It instills life skills -- such as resourcefulness, problem solving, public speaking. If Harrison is streaming, Brammell supervises in the background, folding laundry usually. His hobby hasn't affected the family too dramatically. The worst part has been prying him off the computer if he's working on something he can't finish before school. Harrison is unique. But he says other kids can do what he does. "It's not too hard," he said. "If you can look at something and type, you can code."